Pew Research Center’s surveys have found that national recognition for America’s top news anchors isn’t what it used to be. 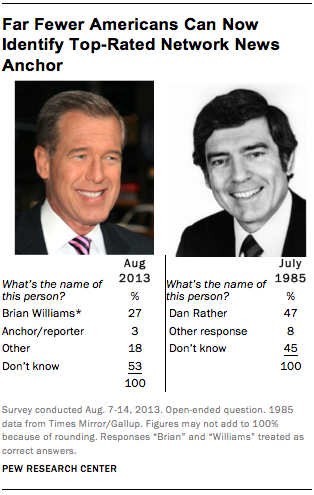 Just 27% of Americans recognized a photo of Brian Williams and correctly identified him in 2013 – a far cry from the 47% of Americans who could correctly identify Dan Rather in a 1985 poll. A poll last fall found NBC News among the most trusted news brands in the country. Half said they trusted NBC News, according to a Pew Research Center survey. That ranked NBC among the highest of 36 news organizations we asked about, on par with ABC News (50%) and CBS News (46%) as well as CNN (54%) and Fox News (44%). While evening news audiences have been steadily declining for some time, they remain a major source for news for many Americans. And NBC Nightly News attracts a middle-aged audience that is roughly the same as that of the major cable networks. Here are 5 facts about NBC and network television and their place in the media landscape. 1Although the network’s audience has steadily declined, NBC Nightly News remains the biggest unique source for news in the U.S. The program averaged nearly 8.5 million viewers per night in 2013, while the median prime-time audience for Fox News was just under 2 million. 2The audience for traditional television-based news, whether on broadcast networks or cable, is roughly the same age as the U.S. adult population overall. The median age for the U.S. adult population is 46, and according to a recent Pew Research survey, the median age for viewers of the nightly network news is only slightly higher. The median age of NBC Nightly News viewers is 52, close to that of CBS and PBS evening news viewers (53). ABC News viewers’ median age is significantly lower, however, at 45 – and they are younger, too, than the median Fox News viewer, at 48. 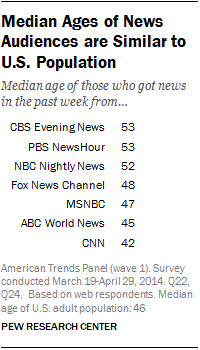 These median ages cluster closely with those of MSNBC (47) and CNN (42). Some non-traditional news sources are more popular among the young: The audience for The Colbert Report, for instance, had a median age of 33. 3More Americans today get their news from a digital device than from network television news – though just as many get news from watching local TV as from a digital device. In a 2013 survey, Pew Research found that 72% get news on a desktop, laptop or mobile device at least sometimes, but fewer (59%) watch national evening network television news sometimes or often. The figure was even lower for cable news (52%) and newspapers (54%), however, while local TV news is viewed at the same rate as digital devices are used for news (72%). 4Network broadcast news programs are part of cable news viewers’ media diets too: 76% who watch cable news also watch network news. But the feeling is not mutual. Only 44% of network news viewers watch cable news. Cable’s audiences are more dedicated, however, watching for an average of 25.3 minutes per day, versus 12.4 for network TV news. 5When it comes to revenue, network news is at a disadvantage compared with cable. The combined revenue for NBC News’ primary broadcast products, the Today Show and the Nightly News, was nearly $850 million in 2012 – a year when they had an added advantage from airing the Summer Olympics. Fox News Channel, however, was projected to bring in nearly $1.8 billion that year, according to the media analysis firm SNL Kagan. Fox News has considerably more hours for which to sell ads than does NBC’s news division, and it has cable subscriber fees to boot. That cable news gets more money out of a smaller audience speaks to the challenges network news faces in the current media landscape.